I have just posted a review of metabolomics. In the last few weeks, the Human Metabolome was published. I am hopeful that my decision has taken the right path to prepare my readers adequately if they will have read the articles that preceded this. I pondered how I would present this massive piece of work, a study using two leukemia cell lines and mapping the features and differences that drive the carcinogenesis pathways, and identify key metabolic signatures in these differentiated cell types and subtypes. It is a culmination of a large collaborative effort that required cell culture, enzymatic assays, mass spectrometry, the full measure of which I need not present here, and a very superb validation of the model with a description of method limitations or conflicts. This is a beautiful piece of work carried out by a small group by today’s standards. I shall begin this by asking a few questions that will be addressed in the article, which I need to beak up into parts, to draw the readers in more effectively. Q 1. What metabolic pathways do you expect to have the largest role in the study about to be presented? Q2. What are the largest metabolic differences that one expects to see in compairing the two lymphoblastic cell lines? Q3. What methods would be used to extract the information based on external metabolites, enzymes, substrates, etc., to create the model for the cell internal metabolome? to investigate metabolic alternations in human diseases. the selection of metabolites consumed and released by cells. remain underdeveloped compared to methods for other omics data. extracting the information from extracellular metabolomics data. our methods can reveal differences in cell metabolism. was supported by our experimental data. the role of these genes in cancer metabolism. unique control points for each cell line model, e.g., phosphoglycerate dehydrogenase for the Molt-4 model. it allows the integration of multiple omics data sets into a cohesive picture based on a defined model context. A model is introduced to demonstrate a lymphocytic integrated data set using to cell lines. 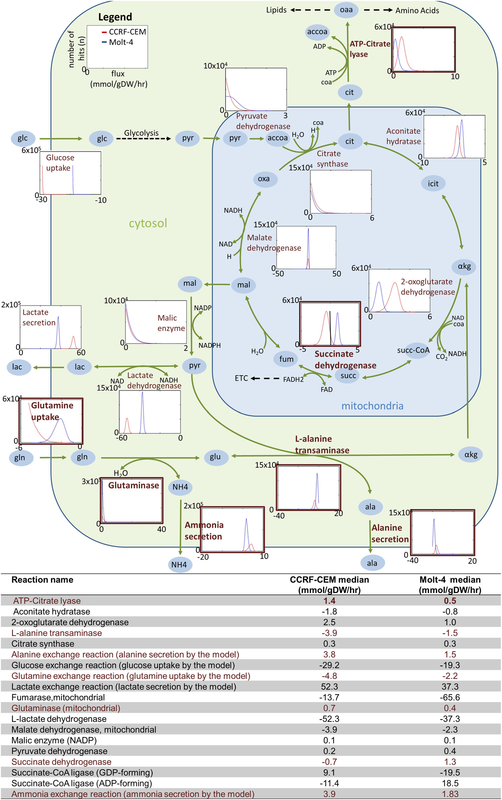 The method is required to integrate extracted data sets from extracellular metabolites to an intracellular picture of cellular metabolism for each cell line. The method predicts a more glycolytic or a more oxidative metabolic framework for one or the othe cell line. The genetic phenotypes differ with a unique control point for each cell line. The model presents an integration of omics data sets into a cohesive picture based on the model context. Is the method a snapshot of the neoplastic processes described? Does the model give insight into the cellular metabolism of an initial cell state for either one or both cell lines? Would one be able to predict a therapeutic strategy based on the model for either or both cell lines? Before proceeding further into the study, I would conjecture that there is no way of knowing the initial state ( consistent with what is described by Ilya Prigogine for a self-organizing system) because the model is based on the study of cultured cells that had an unknown metabolic control profile in a host proliferating bone marrow that is likely B-cell origin. So this is a snapshot of a stable state of two incubated cell lines. Then the question that is raised is whether there is not only a genetic-phenotypic relationship between the cells in culture and the external metabolites produced, but also whether differences can be discerned between the internal metabolic constructions that would fit into a family tree. have increased the pace of biological data generation. provides great opportunities for metabolic discovery. under a particular set of experimental conditions. for the biomedical research community. the prediction of steady-states (Durot et al.2009). extensive organism-specific information from the literature. (Duarte et al. 2007; Thiele et al. 2013). e.g., disease or dietary regimes. the interactions of brain cells (Lewis et al. 2010). to study diverse human disease conditions. to predict drug targets (Folger et al. 2011; Jerby et al. 2012). cancer specific model (Folger et al. 2011). survive a non-functional TCA cycle (Frezza et al. 2011). (Becker and Palsson, 2008; Jerby et al. 2010). that comprise the contextualized metabolic models. inferred from expression values or differential gene expression. (Blazier and Papin, 2012; Hyduke et al. 2013). direct determination of the metabolic network components (the metabolites). particularly valuable for interrogation of metabolic phenotypes. (Li et al. 2013; Mo et al. 2009; Paglia et al. 2012b; Schmidt et al. 2013). (Fleming et al. 2009; Mo et al. 2009). and prediction of internal pathway use. can facilitate the interpretation of metabolomic data. predictions are validated based on targeted experimental data. model refinement and submodel extraction. used for the prediction of drug targets. B Uptake and secretion pattern of model. were unique to one cell line. quantitative constraints for the sampling analysis. (d) metabolite secretion could be x times higher in Molt-4 cells. LOD limit of detection. depended on the ratio detected in vitro. the experimental difference detected between the cell lines. Q5. What is your expectation that this type of integrative approach could be used for facilitating medical data interpretations? The most inventive approach was made years ago by using data constructions from the medical literature by a pioneer in the medical record development, but the technology was not what it is today, and the cost of data input was high. Nevertheless, the data acquisition would not be uniform across institutions, except for those that belong to a consolidated network with all of the data in the cloud, and the calculations would be carried out with a separate engine. However, whether the uniform capture of the massive amount of data needed is not possible in the near foreseeable future. There is no accurate way of assessing the system cost, and predicting the benefits. In carrying this model forward there has to be a minimal amount of insufficient data. The developments in the regulatory sphere have created a high barrier. This concludes a first portion of this presentation.